I own a maltese and a shihtzu. Shitzu is adopted from a abusive home. She is now my baby girl. 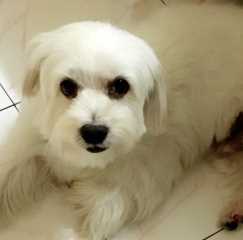 Pedro is the Maltese, i have him since he was 2 months old, he is now 6 and my baby boy. He is a little traumatised and issue trusting other people as he was kidnapped once. Babysitting and transport for the lovely furries. My services are inclusive of dogs and cats. I will make them feel as comfortable as they are in their homes with lots of love and affection. I can also walk them if needed. I am also open to preparing special meals for them if they are picky eaters. My charges are RM30 for weekdays and RM 40 for overnight and weekends. I am very loving and affectionate and will love and care for them as my own. Its very fulfilling to be around these lovely furries, looking in their eyes, seeing their love and appreciation. Also making them feel safe. I feel like i made a difference to their lives . Judith's Pet House Sitting service is located in or nearby Bangsar, Kuala Lumpur. Book via PetBacker for Insurance, Payment protection & 24x7 support. If you have hired Judith before, leave a review now. Contact Judith now with your pets info. If Judith is busy, we can help include similar Backers.